Would you continue to remember your Guru?? This is the time when the army of Mir Mannu was going from house to house searching for Sikhs. Many of the Sikhs took shelter in jungles but some Sikhs who were living with their families in the cities and could not just leave right away or join any jathas. They were captured by the army and all were being sent to Lahore. 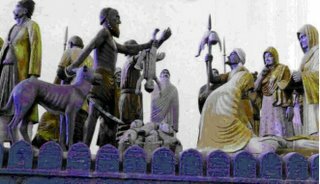 Most of the prisoners were Sikh women and children. Many of the old women were killed on the way because they were weak and could not walk for a long time. All of the Singhnis and their children were put in Lahore jail. For labor they were given “chakkis”. They were given no food or water. 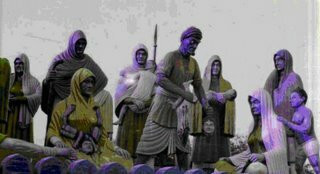 This was a way to torture them so they would leave Sikhi. They were separated from their children. Everyday muslims would come and taunt them by saying “where is your Khalsa now? They can’t even come to rescue you. All of them have been killed by the army. So it is better for you to accept Islam and live a rich happy life.” Singhnis never ever thought of leaving Sikhi. They kept reciting “Waheguru Dhan Guru Waheguru Waheguru”. Hearing this some of the guards were shocked and wondering what Sikhs were made up of? Some of the guards left their jobs by saying “These Sikhs are religious people. We cannot torture these innocent souls. Even their women and children are so strong and brave. They will rule Punjab one day.” Some fanatic muslims were enraged by this. They started to torture her again. Heavy weight was put on her body and her bones were crushed. They hit her with sticks. After so much torture she became Shaheed but she never gave up her faith. Only word that came out of her mouth was “Waheguru Waheguru”. 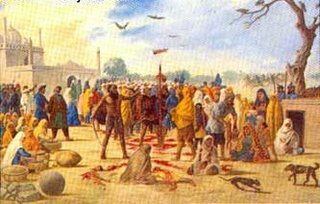 When Singhs heard the news of the tortures, they attacked Lahore and freed all the prisoners and punished the criminals. At the same time mir mannu died a horrible death. In short, Plight of the Sikh ladies detained in the camps of Mir Mannu was miserable. They were tortured and kept thirsty and hungry as they refused to be converted to Islam. Every one of them was allotted a small millstone to grind a fixed quantity of wheat. It was ordered that the children of these ladies be snatched. One soldier threw a child up in the air and the other killed him with his spear before he could touch the ground. The dead bodies of these children were cut into pieces and the ladies were garlanded with those pieces. Pieces of flesh of the children were thrust into the mouth of their mothers. In spite of all that, none of the ladies cried or yielded to embrace Islam Once this horrible scene stunned Mir Mannu. When he reached the palace after visiting the camp, he did not talk to anybody. It seemed he repented. He left for hunting with only four soldiers. While he was hunting, his horse was scared, ran very fast and jumped so high that Mir Mannu could not control it. He fell down, and his feet got entangled in stirrip. Mir Mannu’s cries further scared the horse and it ran faster. It was dragging Mir Mannu and none could stop it. Mir Mannu was badly injured and died in the forest. Daughters of the Khalsa, in your strength our future lies! 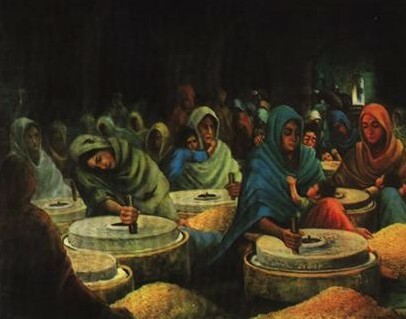 Learn about the Great Spirit of which Sikhs possess, which no one could ever understand. This Spiritual Strength derives from Guru Maharaj (Guru Granth Sahib Ji). It's from Gurbani, Naam Simran, Seva and saacha pyar for the Guru. Give our children fearless minds to see the world through the Guru's eyes! Let our future brothers and sisters strive to become the Khalsa and continue to inspire others by becoming noble, fearless and Chardi-Kala (high-spirited) Sikhs. Let them live up to the standards of those countless Sikhs who spilled blood and laid down their heads for the Khalsa to remain distinct and in ever-existence! Dedicated to the sacred, gracious and benevolent memory of our Divine Father SRI GURU GOBIND SINGH SAHIB and our Divine Mother MATA SAHIB KAUR and those brave Sikh women, who suffered untold oppression in Mir Mannu's prison, who starved and suffered under force labour, and saw their little children cut to pieces, and flung savagely into their laps, yet they still upheld the dignity of Sikhi until their last breath. Their Immortal achievements remain an inspiration to us all for generations to come!